Transforming growth factor (TGF)-β and its receptors are often chronically over-expressed in various human diseases, including cancer, tissue fibrosis, inflammation, and autoimmunity. Therefore, blockade of TGF-β signaling pathway is an attractive target for drug development. 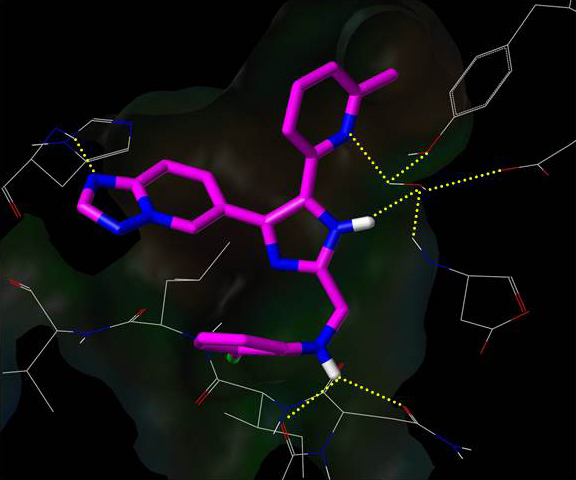 A research group of College of Pharmacy, Ewha Womans University led by professor Kim successfully developed a small-molecule inhibitor of TGF-β type I receptor kinase (activin-like kinase 5; ALK5), EW-7197. EW-7197 inhibits the Smad pathway by occupying the ATP binding site of the ALK5 kinase domain, which is essential for the phosphorylation of its substrates, Smad2/Smad3 proteins. It inhibited ALK5 with IC50 value of 0.013 μM in a kinase assay and with IC50 values of 0.0165 μM and 0.0121 μM in HaCaT (3TP-luc) stable cells and 4T1 (3TP-luc) stable cells, respectively, in a luciferase assay. Selectivity profiling of EW-7197 using a panel of 320 protein kinases including ALK family kinases revealed that it is a highly selective ALK5/ALK4 inhibitor. Pharmacokinetic study with EW-7197•HCl in rats showed an oral bioavailability of 51% with high systemic exposure (AUC) of 1426 ng × h/mL and maximum plasma concentration (Cmax) of 1620 ng/mL. Oral administration of EW-7197 (2.5 mg/kg, daily) for 18 days not only blocked Smad2/Smad3 phosphorylation, but also induced ubiquitin-mediated degradation of Smad4 mainly in CD8+ T cells in melanoma-bearing mice. Treatment with EW-7197 significantly increased the proportions and numbers of CD8+ T cells in the draining lymph nodes and the protein expression of perforin and granzyme B in the draining lymph node CD8+ T cells, thus enhancing CTL activity. The T cell-specific deficiency of Smad4 suppressed the progression of primary melanomas and lympth node metastasis by derepressing eomesodermin, a T-box transcription factor regulating CTL function. EW-7197 inhibited TGF-β/Smad signaling, cell migration, invasion, and lung metastasis in MMTV/c-Neu mice and 4T1 orthotopic-grafted mice, and also inhibited the epithelial-to-mesenchymal transition (EMT) in TGF-β-treated breast cancer cells and 4T1 orthotopic-grafted mice. In addition, EW-7197 demonstrated its pronounced antifibrotic efficacy in animal models of liver fibrosis, lung fibrosis, and renal fibrosis. Thus, treatment with EW-7197 significantly reduced the expression levels of collagen, α-smooth muscle actin, fibronection, 4-hydroxy-2,3-nonenal, and integrins in the livers of CCl4-treated mice and bile duct-ligated rats, in the lungs of bleomycin-treated mice, and in the kidneys of unilateral ureteral obstruction (UUO) mice. It also significantly extended the lifespan of CCl4-treated mice, bile duct-ligated rats, and bleomycin-treated mice. A phase I clinical trial of EW-7197 (TEW-7197) against malignant solid cancer patients is currently undergoing in U.S.
Figure1. Binding pose of EW-7197 in the active site of ALK5 (PDB id: 1RW8). ​(1) Dae-Kee Kim et al. 2-Pyridyl substituted imidazoles as therapeutic ALK5 and/or ALK4 inhibitors. US 8,080,568 B1 (2011). (2) Dae-Kee Kim et al. Methods of treating fibrosis, cancer, and vascular injuries. US 8,513,222 B2 (2013). ​(3) Cheng Hua Jin et al. Discovery of N-((4-([1,2,4]triazolo[1,5-a]pyridin-6-yl)-5-(6-methylpyridin-2-yl)-1H-imidazol-2-yl)methyl)-2-fluoroaniline (EW-7197): a highly potent, selective, and orally bioavailable inhibitor of TGF-β type I receptor kinase as cancer immunotherapeutic/antifibrotic agent. J. Med. Chem. 2014 , 57, 4213-4238. ​(4) Ji Yeon Son et al. 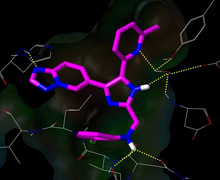 EW-7197, a novel ALK-5 kinase inhibitor, potently inhibits breast to lung metastasis. Mol. Cancer Ther. 2014, 13, 1704-1716. (5) Jeong-Hwan Yoon et al. Activin receptor-like kinase5 inhibition suppresses mouse melanoma by ubiquitin degradation of Smad4, thereby derepressing eomesodermin in cytotoxic T lymphocytes. EMBO Mol. Med. 2013, 5, 1720-1739. (6) Sang-A Park et al. EW-7197 inhibits hepatic, renal, and pulmonary fibrosis by blocking TGF-β/Smad and ROS signaling. Cell. Mol. Life Sci. DOI: 10.1007/S00018-014-1798-6.